The iPhone begins to reach into more markets or points of distribution without exclusivity. 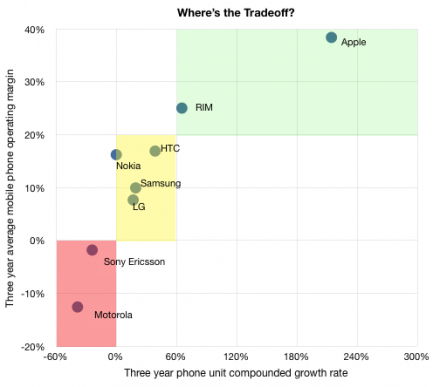 The Android surge will apply competitive pressure forcing Apple’s pricing and hence margins. The second claim can be countered by observing that innovation trumps pricing every time. When looking back at the three years’ history of the industry there is a clear but counter-intuitive demonstration of the power of innovation in the market. The graph shows that companies that grew the fastest had the highest margins, and the companies that grew the slowest had the lowest margins. The trend line in the graph above is precisely orthogonal to what would be expected in a commodity market. The orthogonality of growth vs. margin points to the effect of innovation in this market. In a non-commoditized market (i.e. one where usable improvements in a product are quickly absorbed and highly valued) high growth and high margins are correlated. In a commodity market (i.e. one where improvements in a product are neither absorbed nor valued) growth can only come at the expense of margins. Being able to spot when a market tips from innovation-driven disruption to price-driven commodity sales is an essential skill for both investors and managers. It requires a comprehensive and integrated analysis of technology, finance, consumer behavior, competitive forces and a lot of faith in theory to make the right call. As a keen observer I think the market still has a long way to go before it reaches this tipping point. I don’t see it happening in the next three years (which is just 2 product cycles–the most an outside observer can hope to roadmap).